The Zambezi in all its splendour is like no other river on earth. We start this spectacular rafting journey beneath the thunderous Victoria Falls and paddle out amongst the most breathtaking scenery, with neighbourly hippos lazing on the riverside along the way. Within these perfect surroundings we will encounter powerful and magnificent rapids that will definitely keep you on the edge of your seat! Nights will be spent relaxing, camping on gorgeous warm white sandy beaches with a drink in hand and the humming sounds of wildlife all around. And with a stunning flight through Batoka Gorge and over the gorgeous Victoria Falls to finish, this will be an experience that you will never forget! 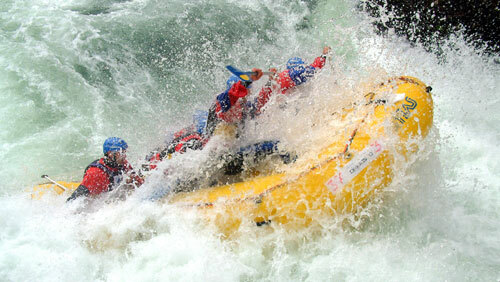 We drift downstream, crashing through more rapids and stopping briefly to restock with supplies. After lunch and powering our way through the longest rapid on the river Ghostrider, we drift downstream enjoying the rest of the day soaking up the sun and spotting crocodiles on the river banks. 24 hours to rest and recuperate. Volleyball, sunbathing, cocktails and cold beers  whatever you fancy! Paddling resumes and a relaxing floating lunch is in order as we drift down the river. Wildlife is in total abundance and we see our 1st signs of civilisation. Final evening camping on the river bank. An early rise and we paddle down the confluence with the Matetsi River where we are met by our gear truck. Then we have a real finale to the trip  we are picked up by helicopter and flown right back up the river giving an amazing view of the previous 7 days excitement. A truly breathtaking end to any river trip. And it doesnt end there - we are dropped at our luxury hotel, high on the banks of the river. Sitting on the balcony above the rapids enjoying sundowners is the perfect finish to any trip. Time to cruise around town and do last minute retail therapy before boarding your flight back home. As an extension we also offer a 3 day Game Safari in Botswana. With the chance to get up-close and personal with elephants, lions and leopards, this is the perfect finale to your adventure and a real taste of Africa.